The Cavaliers fell hard against the Indiana Pacers in Cleveland on Sunday. LeBron James and the Cavaliers lost 98-80 in game one to the Pacers after Indiana outscored them 33-14 in the first quarter. 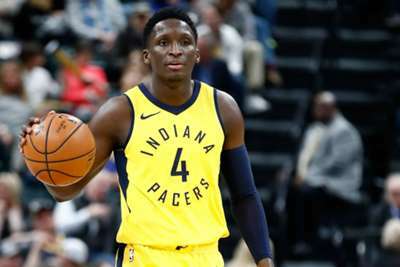 Victor Oladipo led the Pacers with 32 points, six rebounds and four assists. After draining just six of 25 from three-point range last postseason with the Thunder, Oladipo made six of nine from deep. James recorded a triple-double for the Cavs, scoring 24 points with 12 assists and 10 rebounds, but no one else in the starting lineup scored over nine points (Kevin Love and Rodney Hood). Instead, Cleveland's secondary source of points came from J.R. Smith's 15 off the bench. The Cavaliers cut Indiana's lead to just eight points entering the fourth quarter, but the Pacers started the game with more fire, and ended it that way too, outscoring the Cavs 25-15 in the fourth quarter. Myles Turner helped spark Indiana's elite defensive effort by scoring 16 points with eight rebounds and a block. The Pacers forced 16 Cavs turnovers, and held Cleveland to just 38.5 shooting from the field. The Pacers' win snapped James' streak of 21 straight first-round playoff victories. The NBA playoffs rarely get upsets in the first round, but the Pacers downing the three-time defending East champions would certainly raise some eyebrows. Meanwhile, James Harden scored 44 points on 15-of-26 shooting with eight assists to help the Rockets escape game one with a 104-101 win over the Timberwolves. Harden’s 44 points were one shy of tying his playoff career-high and five points shy of tying the Rockets' all-time record. Houston center Clint Capela led the way early, finishing the game with 24 points and 12 rebounds. The Rockets were outscored in the third and fourth quarters, but still managed to sneak out a win. Paul George and Russell Westbrook led the Thunder to a 116-108 game-one win over the Jazz. George scored 36 points with seven rebounds, while Westbrook flirted with a triple-double, scoring 29 points with 13 rebounds and eight assists. The Celtics featured five players with at least 19 points in their 113-107 overtime game-one win over the Bucks. Al Horford led the way with 24 points and 12 rebounds. Terry Rozier added 23 points, Marcus Morris had 21 from off the bench, Jaylen Brown scored 20 points, and Jayson Tatum added 19 points and 10 rebounds. With Kyrie Irving and Marcus Smart out of the lineup, Boston need to maintain a balanced scoring attack to contend. Bucks guard Eric Bledsoe was given a golden opportunity this season, moving from the Suns to Milwaukee, but the mercurial guard did not take advantage of his playoff opportunity, scoring just nine points on four-of-12 shooting. He also turned the ball over five times and had just four assists. Kevin Love produced a four-point play. Golden State, missing Stephen Curry, looked far better off than the Spurs, who are still without Kawhi Leonard. The Warriors' depth and star power should help them overcome Curry's absence in this series, but the defending champions will need their star point guard by the time Houston come calling. San Antonio need LaMarcus Aldridge to play out of his mind in order to draw this series out at all.